I have received a few emails regarding the Asia trip that I went on a few months back in September 2012. The number one question asked was “Where is that stunning pool in Singapore?” Before I dive into that subject, I wanted to take a moment and thank you all for the love and support you have shown me. Your support inspires me to continue writing and sharing my passions! 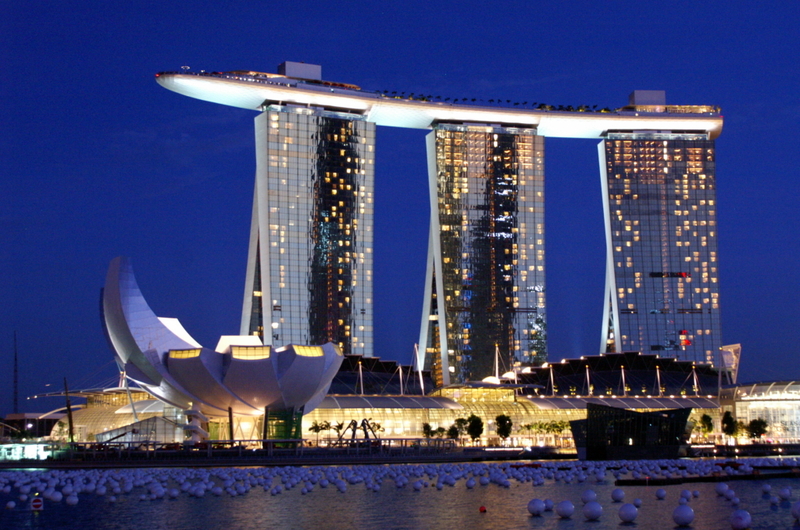 We stayed at the Marina Bay Sands (http://www.marinabaysands.com). There are MANY attractions that this hotel is known for – food, shopping, gambling, and botanical gardens, just to name a few – that it would take me a few pages to write about. 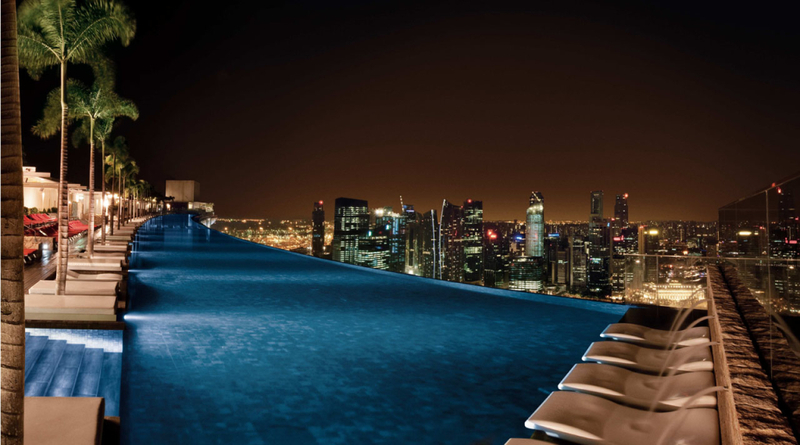 So, for your sake, I will split the amenities into different posts and start with what they are most famous for: the iconic Sands Skypark and infinity pool on the 57th floor. 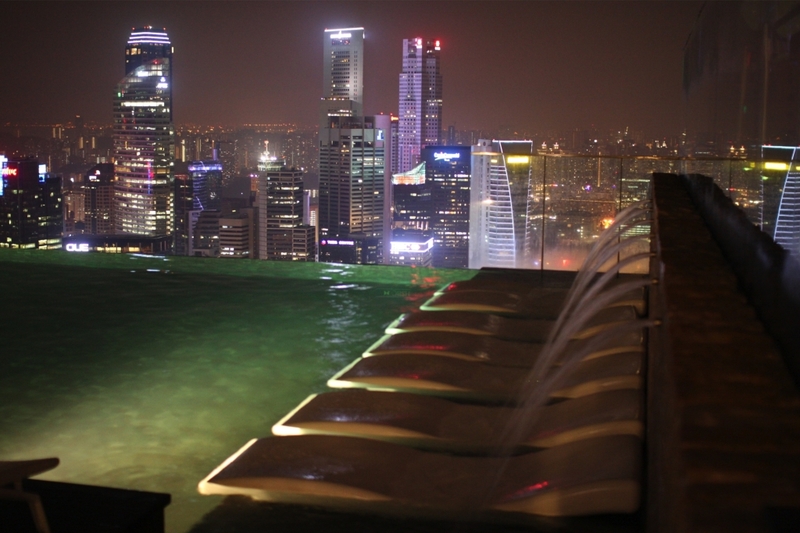 This pool is considered one of the top ten hotel rooftop pools in the world! Ummm … OBVIOUSLY! FYI – You have to be a guest of the hotel in order to use the pool. For non-guests, I believe for a $25.00 fee, you can visit the observation deck to get a view of the city and the pool. 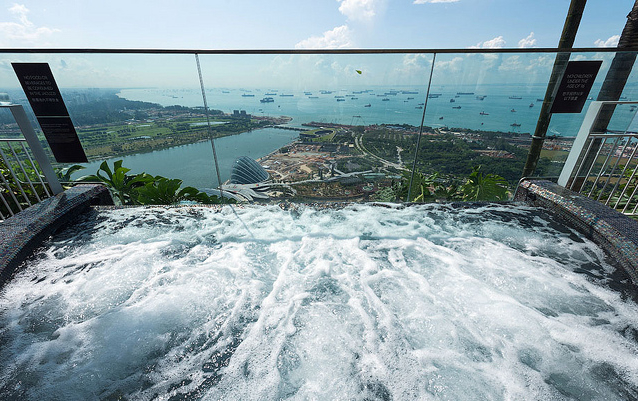 If the pool is not your “thing,” check out the multiple jacuzzis on the other side of the skyport with amazing views of the Gardens by the Bay (botanical gardens) and the Strait of Singapore. Every night when the temperature would drop, I loved going into the jacuzzi to relax and listen to the music playing from the lounge. Oh, how I miss it! After going for a nice dip in the pool and then indulging in refreshing drinks, you surely will have build up an appetite. Worry no longer! There are three AMAZING restaurants, one being a Chocolate Bar, right outside the pool. Oh yes, you read that correctly – THE CHOCOLATE BAR! 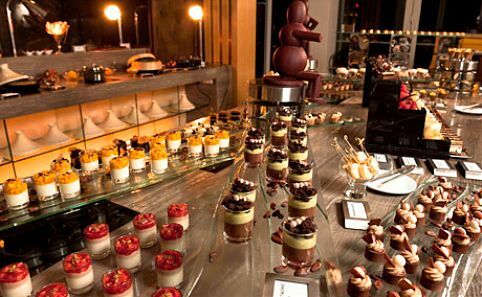 For you chocolate connoisseurs, there is a full blown chocolate buffet that offers 57 decadent premium desserts crafted by hand. To die for! Wait – there’s more! Haha, I sound like an infomercial. While chillin’ by the pool, you can’t help but jam along to the music from KU DÉ TA. Recognized internationally as the leading lifestyle destination in Asia, KU DÉ TA is a restaurant/bar/lounge that serves up a menu of Modern Asian cuisine while offering a 360-degree panoramic view of the Singapore skyline. Make sure you add this lounge to your list of things to do in Singapore, because it’s one of the top MUST-DO’s for those of you who like to dance and have a drink or two. I’ll let the pictures do the rest of the talking! Side note, they were taken on a day that was slightly foggy. And if you have any questions or comments, please shoot me an email or a post a comment! Thank you!